Just as the 9/11 terrorist attacks resulted in a profound change in the way Americans thought about their place in the world, the changes brought about by World War II and its aftermath profoundly affected people’s understanding of life. The threat of atomic death from on high ushered in the Cold War, at least for those in the Western world. The Cold War, in turn, led to the "Red Scare." Promulgated through government propaganda and manipulation, anti-Communist sentiments soon took the form of a mass hysteria in the United States that viewed anyone and everyone as suspect — your friends, the next-door neighbor, even your family members could be a Communist subversive. This hysteria culminated in hearings before the House Un-American Activities Committee (HUAC), where hundreds of Americans were called before Congress to testify about their so-called Communist affiliations and intimidated into making confessions — many of which were false. As a result of the hearings, many lost their jobs and families. Some even committed suicide. Then, as now, those in power had a penchant for enacting extreme measures to combat perceived threats. However, unlike America post-9/11, the American government circa the 1950s did not have at its disposal the arsenal of invasive technologies that is such an intrinsic part of our modern surveillance state: today, we are watched and tracked 24/7; data is collected on us at an alarming rate by governmental and corporate entities; and with the help of powerful computer programs, American domestic intelligence agencies sweep our websites, listen in on our telephone calls and read our text messages at will. Yet even in our present police state, with our lives and bureaucratic structure now oriented around a fear of the next terrorist attack, the underlying principle remains the same as it was over 50 years ago — namely, can we hold onto our basic freedoms and avoid succumbing to the soul-sucking dredge of conformity that threatens our very humanity? This question is at the heart of director Don Siegel’s 1956 classic Invasion of the Body Snatchers, a film that not only captured the ideology and politics of its day but remains timely and relevant as it relates to the worries that plague us today. Body Snatchers brought respectability to the science fiction genre that emerged in the post-war era. Filmed with only seven days of rehearsal and 23 days of actual shooting, Body Snatchers (now available on DVD and digitally re-mastered) is considered one of the great science fiction classics. It continues to fascinate modern filmmakers, having been remade several times, and has served as a model and subtext for a myriad of films and television shows. It has also become one of the most analyzed films of its kind. 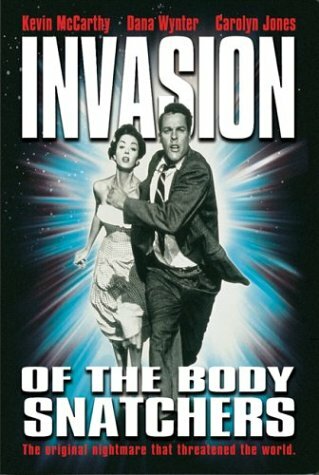 Body Snatchers is set in a small California town which has been infiltrated by mysterious pods from outer space that replicate and take the place of humans who then become conforming non-individuals. Miles Bennell, the main character, is a local doctor who resists the invaders and their attempts to erase humanity from the face of the earth. At the very least, the film conveys a double meaning, serving as both a mirror of a particular moment in history and a compass pointing to a growing societal illness. Following World War II with the emerging military empire, the atomic bomb and the Korean War, Americans were confused and neurotically preoccupied with domestic threats and international political events — much like they are today. Siegel’s film addressed the dehumanization of individuals — a sensitive subject in an age filled with tales of political brainwashing of American soldiers by the Koreans — and the horrifying possibility that humanity could become infused as part of the societal machine. Central to the film is one key speech by Bennell. While hiding from the aliens, he says, "In my practice, I see how people have allowed their humanity to drain away…only it happens slowly instead of all at once. They didn’t seem to mind…. All of us, a little bit. We harden our hearts…grow callous…only when we have to fight to stay human do we realize how precious it is." As Siegel makes clear, it is not the Communists or terrorists who are the villains: We are the villains. In this way, Body Snatchers identifies the real demons at work then and now. Communism at the time was largely a convenient scapegoat, a boogeyman reflecting the fears and tensions of those in power. "If the pods in Invasion seem to incarnate the popular image of a communist totalitarian state," Al LaValley writes in his book on the film, "it is only because the government-dominated, bureaucratic, and conformist fifties was itself creating an America like this picture of Soviet Russia." The only resistance to the perceived repression, Body Snatchers tells us, is an embattled individualism. There is hope in the defiant individual. The conflict between society and the individual is a perpetual one. And the villains are not so much on the other side of the world as all around us. The real enemy, therefore, is invasive governmental measures — something we now see happening across the country — and, thus, totalitarian conformity. And resistance must be against all government measures that threaten our civil liberties and against all kinds of conformity, no matter the shape, size or color of the package it comes in. If not, the enemy lulls us into giving up our individuality. Because of the Red Scare and the HUAC hearings, Body Snatchers also presents the fascistic pod people as the American majority: the central government, law enforcement agencies and communication regulators that dictate America’s political line. Government officials, therefore, not the Communists or terrorists, pose the true threat. These are the pod people who search out rebels like Bennell who refuse to conform to what has been defined as the "American Way." The mob hysteria, sense of paranoia, fascist police and the witch-hunt atmosphere of the film mirror the ills of a 1950s America that is frighteningly applicable to present American society. People are pods. Many of my associates are certainly pods. They have no feelings. They exist, breathe, sleep. To be a pod means that you have no passion, no anger, the spark has left you…of course, there’s a very strong case for being a pod. These pods, who get rid of pain, ill-health and mental disturbances are, in a sense, doing good. It happens to leave you in a very dull world but that, by the way, is the world that most of us live in. It’s the same as people who welcome going into the army or prison. There’s regimentation, a lack of having to make up your mind, face decisions…. People are becoming vegetables. I don’t know what the answer is except an awareness of it.